The mysterious season of Advent is almost here. It is a season of waiting, longing, and calling out for God to be more present in this broken yet beautiful world. At SALT, we want to make the most of the four weeks leading up to Christmas by lighting candles, reading scripture, praying, and meditating - wanna join us? All you have to do is visit us often throughout the next few weeks for ideas, practices, poetry, photography, and fun ideas to get ready for Christmas. So, without further adieu, here’s a little service you can do alone, with your spouse, or with your family this Sunday to start the season off right! Advent is a time of waiting, watching, and praying for God to be made more present in the world. As Christians, we believe that love is stronger than hate, peace more enduring than war, and that God’s hope will extinguish forever the shadows of shame cast by war, sickness, violence, and absence of tenderness. God buries hope in the tiniest moments – a smile offered to a stranger, a plate of cookies for a lonely neighbor, a prayer lifted up for the people of Rwanda – and the world is never the same! Loving God, during this season of dark, blue shadows, illuminate every heart so that the shadows of shame might take flight, and the light of your hope might take root in our lives. Amen. Word AIDS Day, Saturday, December 1 – pray without ceasing that the stigma and shame of HIV/AIDS might be lifted and that medicine might be available for everyone. 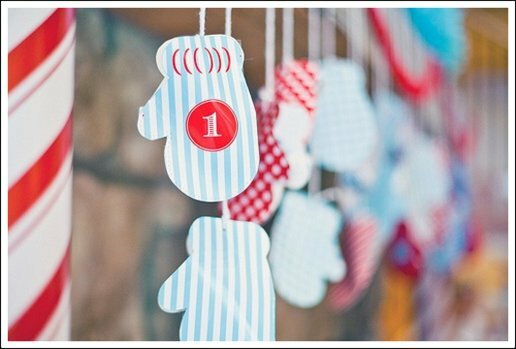 Thanks to Anders Ruff Custom Designs for these sweeter than sweet Advent Calendar Printable Mittens. We heart them!